The Dublin ladies warm up at Croke Park. 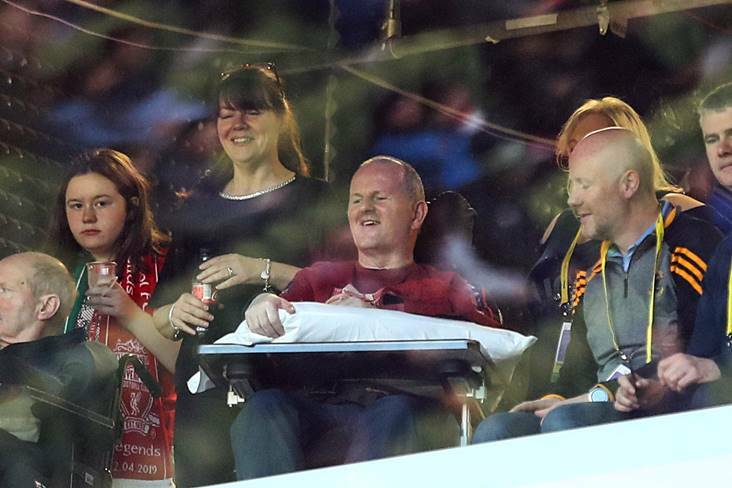 ©INPHO/Oisin Keniry. THE 2019 Lidl Ladies National Football League gets underway this weekend – with 16 games scheduled across all four divisions. Lidl NFL Division 1 champions begin the defence of their title with a home fixture against Donegal at Croke Park, a game that will be LIVE on eir sport and on the channel’s Facebook Page. Cork and Galway get Division 1 underway earlier in the day in Mallow, before 2018 Division 1 runners-up Mayo host newly-promoted Tipperary, and Monaghan travel to Westmeath on Sunday. Waterford and Wexford meet in a South-East derby in Division 2 on Saturday, with the other three fixtures in that group fixed for Sunday. There are three Division 3 fixtures on Saturday, while Offaly play Down on Sunday. All four Division 4 fixtures are down for decision on Sunday and history will be made at Terry Coyle Park on Sunday when the Ladies Gaelic Football Association screens a Lidl NFL fixture LIVE on Facebook for the very first time. 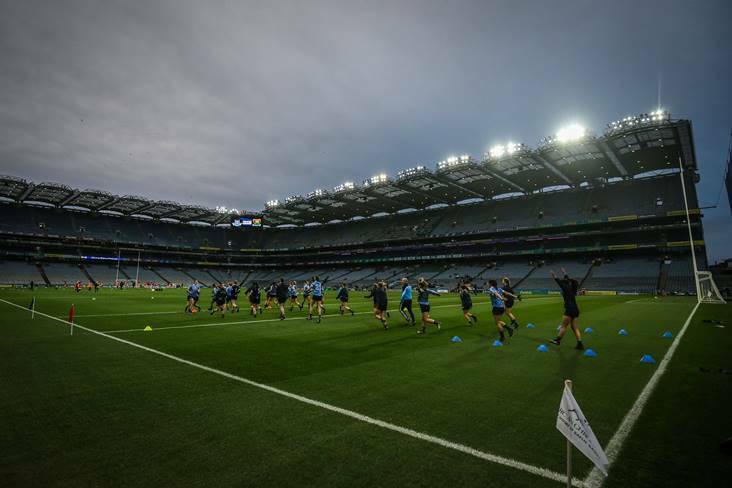 Dublin begin the defence of their Lidl NFL Division 1 title with a home fixture against Donegal at Croke Park (5pm – eir sport). Boss Mick Bohan has named eight of the team that lined out in last September’s TG4 All-Ireland Senior Final victory over Cork. All Star goalkeeper Ciara Trant will captain the side, with a number of leading names including skipper Sinéad Aherne, the 2018 Senior Players’ Player of the Year, Noelle Healy and Sinead Goldrick and Sinead Finnegan, not in the matchday squad at the start of the campaign. Dublin are League holders and favourites to retain this title – as the first of 14 ‘double-header’ fixtures alongside the host county’s male counterparts pits the Sky Blues against Donegal. Visiting manager Maxi Curran doesn’t have Yvonne Bonner as she’s with the Greater Western Sydney Giants in the Australian Women’s AFL. 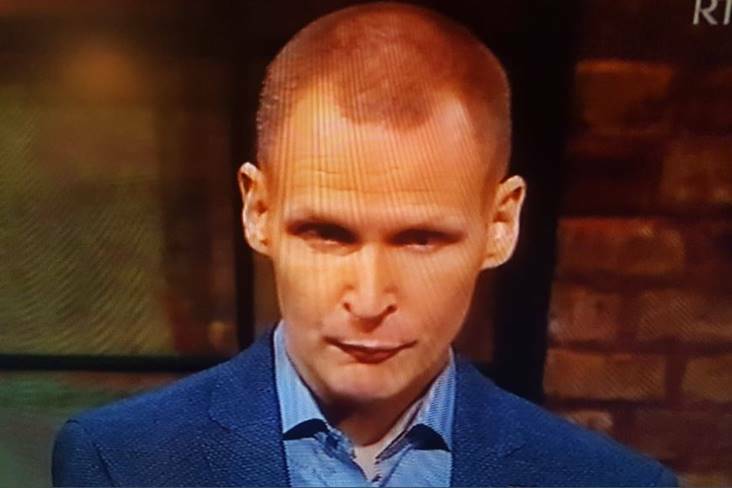 But he does have six players listed who started Donegal’s last competitive fixture – the 2018 TG4 All-Ireland semi-final loss to Cork. All Star Treasa Doherty, Nicole McLaughlin, Katy Herron, Niamh Hegarty, skipper Karen Guthrie and ace scorer Geraldine McLaughlin will bring much-needed experience to Croke Park on Saturday evening. WITH Doireann O’Sullivan not in the Cork matchday squad for their Lidl National League Division 1 opener against Galway in Mallow on Saturday, manager Ephie Fitzgerald has named goalkeeper Martina O’Brien as team captain. O’Brien is one of nine players who started in the 2018 TG4 All-Ireland Final loss to Dublin, who are named to line out from the throw-in against the visiting Tribeswomen. Shauna Kelly, Hannah Looney, Ashling Hutchings, Emma Spillane, Melissa Duggan, Aine O’Sullivan, Libby Coppinger, Eimear Scally and Orla Finn are included in an impressive Cork line-up, while Niamh Cotter makes a welcome return to the set-up. Twin sisters Eimear and Daire Kiely, from Valley Rovers, are named in the Cork starting team, along with other former All-Ireland Minor A medallists, Ciara McCarthy and Laura O’Mahony. Opponents Galway line out with nine players who started against Dublin in last year’s TG4 All-Ireland semi-final defeat – Fabienne Cooney, Sarah Lynch, Charlotte Cooney, Aine McDonagh, Louise Ward, Olivia Divilly, captain Tracey Leonard, Roisin Leonard and Leanne Coen. Emer Flaherty, 2004 All-Ireland medallist and two-time All Star, confirmed her retirement from inter-county football this week. Waterford were the only team to beat Tipperary in Division 2 last year and they will fancy themselves to have another decent campaign. This South-East derby pits the Déise against Wexford, who remain under the stewardship of Anthony Masterson. This is Ciaran Curran’s first game in charge of Waterford after he took over the reins from Pat Sullivan, who achieved a considerable degree of success during his tenure. Wexford were crowned Division 3 champions in 2018 and it will be interesting to see how they adapt to life in the second tier. Sligo, who were relegated last year, have home advantage against Meath for this Division 3 opener. New manager John O’Hara will hope for a promotion push but this is a competitive division and Meath, beaten divisional finalists last year, will hope to go one better in 2019. There’s a good vibe about the Longford camp under the guidance of Westmeath native Enda Sheridan – and they’ll look to make home advantage count against visitors Kildare. But the Lilywhites are dangerous opposition for any team and Daniel Moynihan will have learned a lot during his first season in charge – and having him back on board for 2019 ensures continuity for Kildare. Roscommon are the reigning Connacht Intermediate champions but face a sticky Division 3 opener against Wicklow. The visitors from the Garden County won the Division 4 crown in some style last year and will hope to make a successful transition to the third tier. Mayo were beaten finalists in Division 1 last year but this is a new panel of players for manager Peter Leahy, with a fair sprinkling of experience still on board. Tipp were relegated from the senior championship ranks last year but their rise through the Divisions has been impressive. 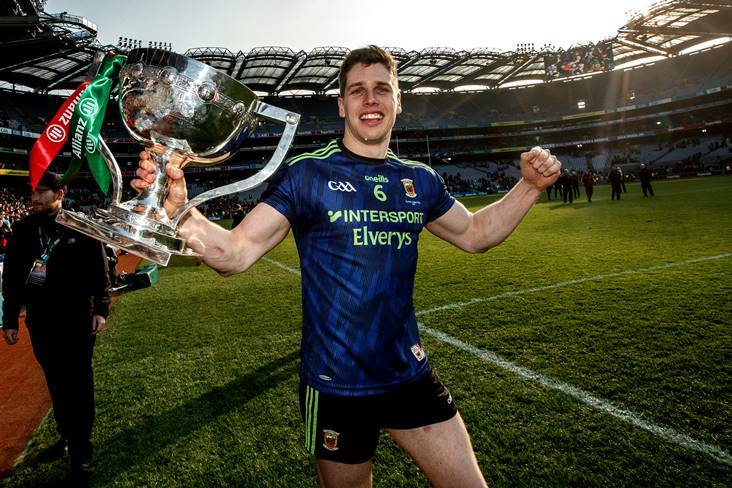 Division 3 champions in 2017, Tipp landed the Division 2 title 12 months later and will now look to consolidate in the top flight. The visitors will look to Aishling Moloney for attacking inspiration while Elaine Fitzpatrick’s return from long-term injury is a boost. 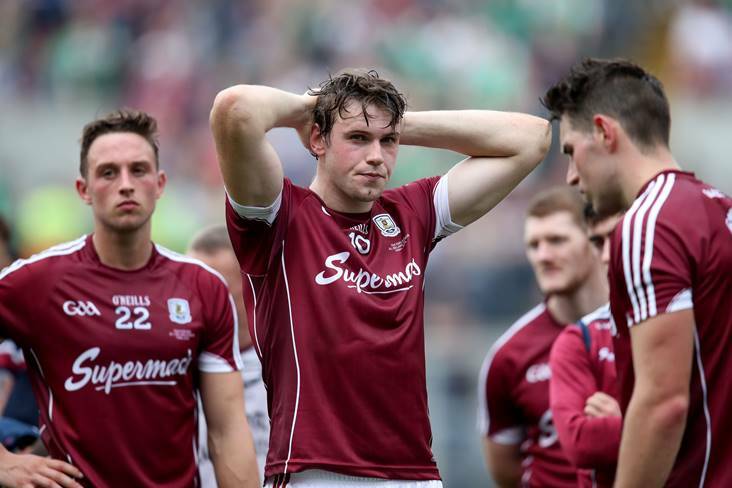 Westmeath avoided the drop to the Division 2 last term but will need a big improvement this year to steer clear of the relegation zone again. Sean Finnegan has taken over the reins from Stephen Maxwell and he’s been handed a home fixture in Round 1. 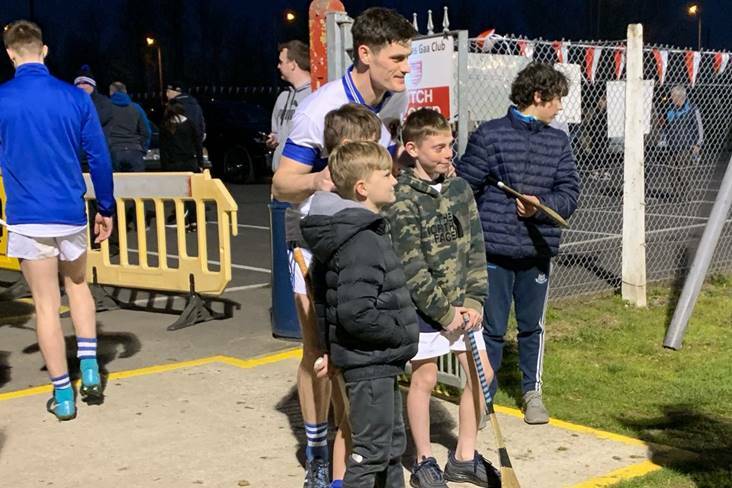 Visitors Monaghan are also under new management in the form of Niall Treanor and they have a formidable midfield partnership in Muireann Atkinson and captain Cora Courtney. Ciara McAnespie remains as lethal as ever in the Monaghan inside line, while Westmeath will hope for the experienced Maud Annie Foley and Leanne Slevin to provide some attacking impetus. In a strong Division 1, these are two teams who will hope first and foremost to steer clear of relegation trouble. A strong start is vital for both sides and this promises to be a competitive fixture on Sunday. A Munster derby sees Kerry, relegated from the top flight in 2018, make the visit to Doonbeg. Hosts Clare will fancy their chances of launching a promotion push and manager James Murrihy has retained Laurie Ryan as skipper, but Ailish Considine is away with the Adelaide Crows in the Australian Women’s AFL. Murrihy has also secured the services of former Mayo backroom man DJ Collins as coach, while Kerry have Donal O’Doherty on board as their new manager. Amanda Brosnan has taken over as captain from Sarah Houlihan – and both of these influential players should play key roles on Sunday. Armagh will look to lay down a marker when they make the trip to Emo on Sunday. Beaten semi-finalists against Tipperary last year, the Orchard County have Kelly Mallon as captain for the year – while Aimee Mackin is one of the most dangerous forwards in the country. Caroline O’Hanlon will pull the strings from midfield and Laois will have to be at their best to hold out. There’s plenty of talent in the Laois ranks but the O’Moore County lost by nine points on their visit to Sunday’s opponents last year. 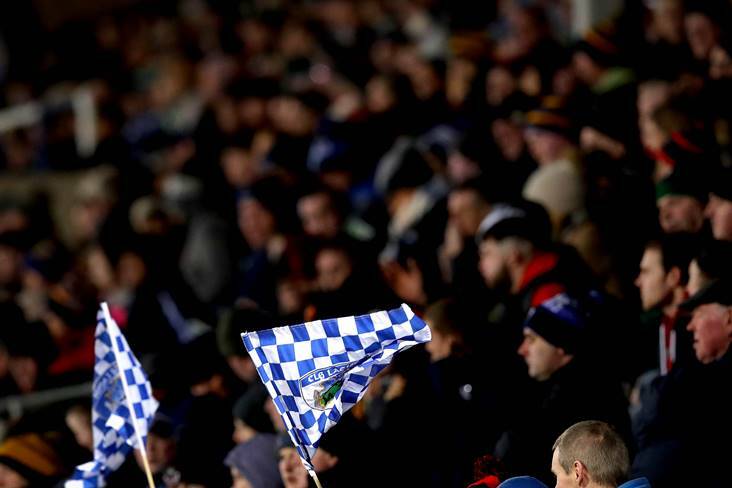 Laois lost five of their seven Division 2 games in 2018 – but avoided the drop with victory over Sligo in the final round of regulation fixtures. History in the making on Sunday as Cavan host Tyrone at Terry Coyle Park. For the very first time, the Ladies Gaelic Football Association will stream a Lidl National League Fixture LIVE on Facebook. 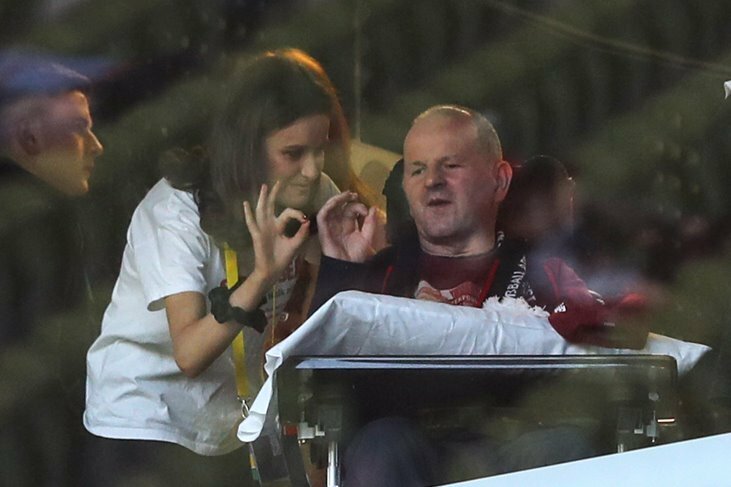 Jerome Quinn is in the commentary box with Cavan’s former TG4 All-Ireland Intermediate Championship winner Ailish Cornyn – and coverage provided by MAC AV gets underway at 12.15pm. Tyrone are the reigning TG4 All-Ireland Intermediate champions and will have promotion from Division 2 as a realistic goal this year. Cavan will need sisters Aishling and Geraldine Sheridan on form in attack, as Tyrone begin life without retired former forward Gemma Begley, who recently announced her retirement from the inter-county scene. 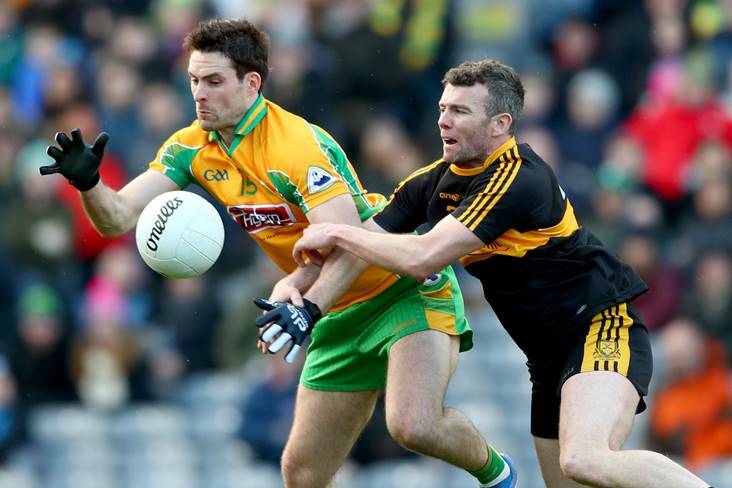 Offaly were quite competitive in Division 3 last year – but failed to make the top four. The Faithful County claimed Wexford’s scalp in the 2018 competition but four defeats scuppered a promotion push. Just a point separated these counties when they met in round 4 last year – with Down coming out on top. 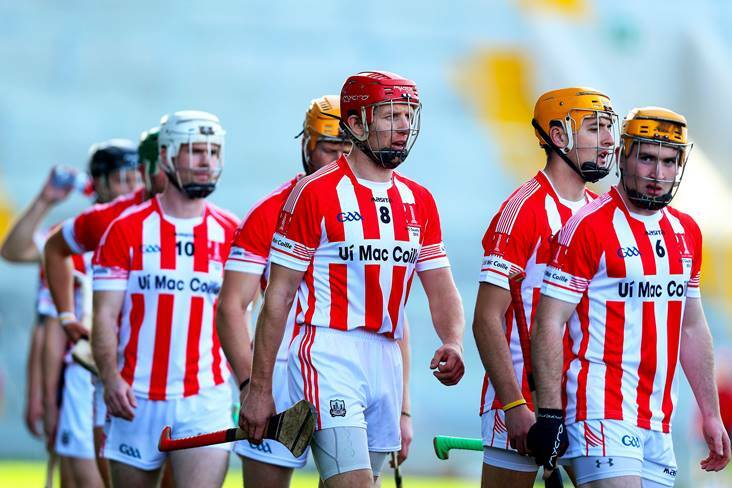 Kilkenny finished rock bottom of Division 4 last year and will hope for improvement. Carlow ended up third from bottom in the 2018 standings but they beat Kilkenny and Derry along the way – and drew with Limerick, who ended up winning the TG4 All-Ireland Junior crown. This tie is a repeat of the 2018 TG4 All-Ireland Junior Final – which Limerick won in famous fashion at Croke Park. The Shannonsiders also contested a Division 4 semi-final last year, against Louth, and will look to finish in the top four again. 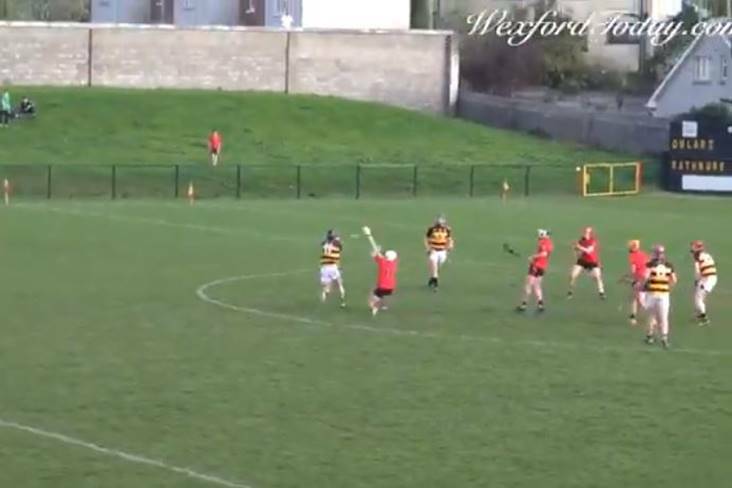 Louth were beaten Division 4 Finalists against Wicklow in 2018 – and are aiming to go one better by claiming promotion. Leitrim, under new manager Gavin Cawley, are back in competitive action after failing to field a team in 2018. Antrim lost to Wicklow in the 2018 Division 4 semi-final and will be looking to reach the knockout stages again. An interesting Ulster derby sees Fermanagh hosting Derry in Derrygonnelly. Fermanagh were unlucky to be edged out of the top four last year but Derry’s campaign was underwhelming, as they finished second from bottom.